Architecture is often as much about expression as it is about practical use. From a palace built by one man with stones to a futuristic house constructed on a lot that was just about unusable to a shopping center designed to look as if it was melting in on itself, the following buildings run the gamut from simply amazing to truly bizarre. Built by one man, Le Palis Idéal is truly an amazing example of naïve art. Built by Ferdinand Cheval over the course of 33 years, Le Palais is just over 85 feet long, 50 feet wide and is about 32 feet tall at its highest point. A mail carrier, Cheval's inspiration came from the shape of a stone he stumbled over while on his daily route. He began collecting stones, carrying them in his pockets while working and eventually turned to marking stones while on his route then coming back for them later with a wheelbarrow. He was dedicated to building his "Ideal Palace" and often worked into the night by the light of an oil lamp. He endured the mockery of his village, who thought he was crazy, but Cheval was eventually acknowledged by luminaries, such as Pablo Picaso, for his amazing work. Le Palais Idéal is a combination of architectural styles from many cultures, time periods and religions. It is covered with inscriptions, figures of animals and famous people. 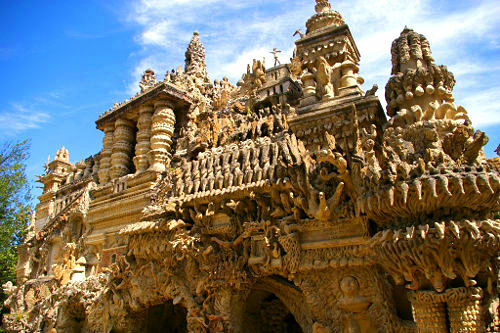 Cheval wanted to be buried in Le Palais Idéal but due to French laws that was not possible. So he built himself a stone mausoleum in a nearby cemetery about a mile away. He died in 1924 at the age of 88. In 1969, Le Palai Idéal was declared a cultural landmark and officially protected by the French Government and is now a popular tourist site, with over 120,000 visitors a year. 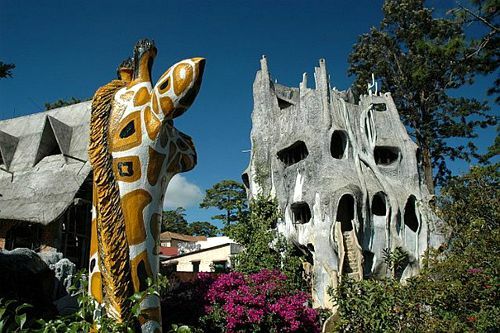 Officially named Hang Nga Guesthouse but more commonly known as the Crazy House, this hotel is truly bizarre. Built to resemble a tree, the Daliesque Crazy House branches out in all directions. Its heavy lines give the sense that it could be melting down itself and the chaotic twists and turns give it a dark fairy tale quality. 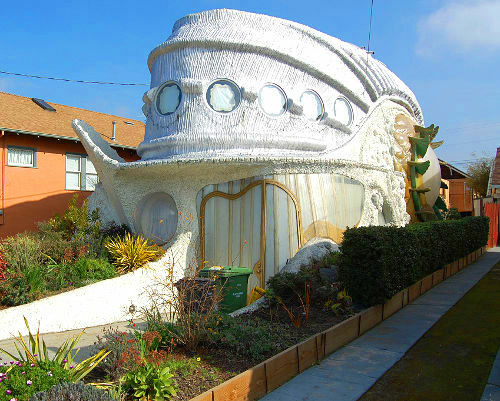 The inside is just as eccentric as the outside. Each room is themed – the Tiger Room has a tiger creeping down the fireplace chimney and an enormous ant crawling on a wall gives the Ant Room its name. Designer and owner Hang Nga was inspired by nature to build the surreal tree house. The guesthouse is open to visitors who would just like a tour as well as overnight guests. 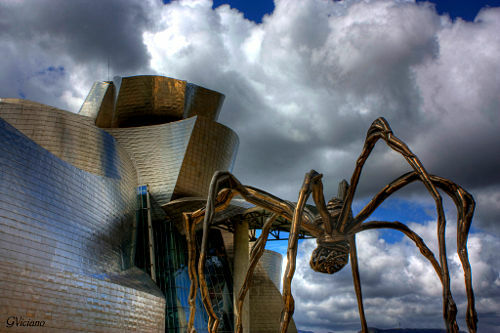 Designed by Frank Gehry, the Guggenheim Museum Bilboa is a spectacular work of art in and of itself. Located in Spain’s Basque Country in the port town of Bilbao, the building is modeled to look like a ship. Its seemingly random curves and scale-like titanium panels give the museum a fluid feeling, reminiscent of the ocean and the shipbuilding history of the town. The Guggenheim Museum is just one of several projects designed to help revitalize Bilboa and, since its opening in 1997, it has attracted visitors from all over the world – some to view the art inside and all to see the magnificent building outside. The inspiration for the Tsui house came from the Tardigrade - the world’s most indestructible creature. Designer Dr. Eugene Tsui followed nature’s form to build, not only a visually interesting home but also a strong one. Internationally recognized as the world’s safest house, the walls are constructed of Rastrablock (recycled Styrofoam and cement blocks) which are water, fire and termite resistant. The base of the house is built almost 5 feet underground and the curving roof is made of layers of stress wood sheeting and sprayed with concrete, making the house extremely well insulated as well as nearly earthquake proof. Designed with ecological sustainability in mind, construction of the Tsui house was finished in 1995 at a cost of $250,000. Waldpirale, or Wooded Spiral in English, is very appropriately named. The curving rooftop is nearly covered with a rich forest of maple, beech and lime trees, flowers, shrubs and grass. The entire building is a testament to its designer’s, Austrian architect and painter Friedensreich, love of nature and organic lines. Each element of the building flows in to the next. Not one of the more than 1000 windows in the complex is the same shape. The interior corners reflect the exterior design, also flowing in soft, curved lines. The walls flow into each other and the ceiling flows into the walls. Waldspirale is a residential building housing 105 apartments and is 12 stories at its tallest. The building wraps around an inner courtyard with a playground, small lake and stream. There is also a rooftop café and bar. It was completed in 2000. 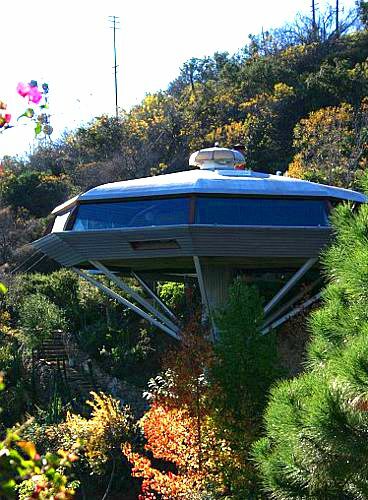 Built in the late 1950s by John Lautner, Chemosphere is not your average single-family home. It looks like a spaceship, is built on a 45 degree sloping hill and is accessible by a funicular (cable railway). The octagonal house was built on a budget of $30,000 and is the result of “innovative problem solving”. It has survived earthquakes and heavy rains due to its well built concrete base and post. Chemosphere was renovated in recent years after being left to languish for over a decade. Inside is 2200 sq ft of living space and a spectacular view of Los Angeles. 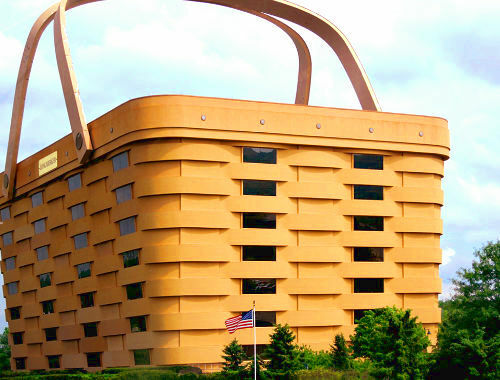 The Longaberger Company’s home office is the largest basket building in the world. Modeled after their best seller, the Medium Market Basket, the building is 160 times the size of the retail basket (take a look at the flag and trees for scale). Founder Dave Longaberger originally wanted all company buildings to be modeled after baskets but the idea was vetoed by his daughters, who now run the company. The oversized handles are affixed to the building with replica copper and wooden rivets and are heated to prevent ice from forming. One of Dave Longaberger’s axioms is said to be: ”If they can put a man on the moon, they can certainly build a building that’s shaped like a basket.” And so he did. The Spaarne Hospital Bus Station is largest structure in the world made entirely from synthetic material. 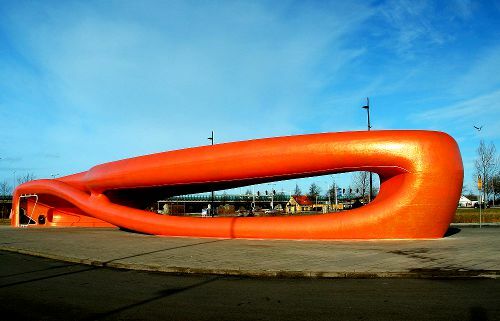 Measuring 50m x 10m x 5m, the designers, NIO Architecten, call it the “Amazing Whale Jaw”. Constructed using polystyrene foam, the bus station was built off site in a workshop, cut into five sections using computer controlled cutting devices and then reassembled at its current site. After being glued together, a final layer of polyester was sprayed on and it was secured to the ground. "The shark was to express someone feeling totally impotent and ripping a hole in their roof out of a sense of impotence and anger and desperation.... It is saying something about CND, nuclear power, Chernobyl and Nagasaki." The shark sculpture appeared on the 41st anniversary of the dropping of the atomic bomb on Nagasaki. The shark is no stranger to controversy and the Oxford City Council tried to have it removed, offering to have it displayed in a public swimming pool. 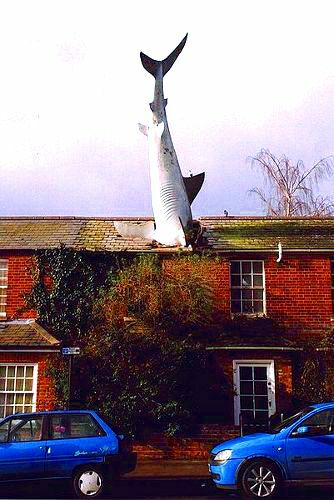 Mr. Heine won his appeal to keep the shark in his roof and the Headington Shark is now just part of the scenery on New High Street. 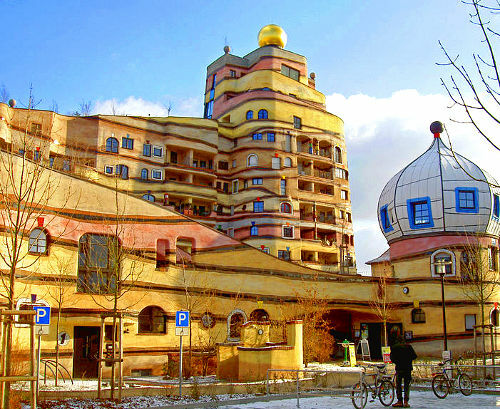 Since it’s opening in 2004, The Krzywy Domek has become one of the most photographed buildings in all of Poland. Inspired by the fairytale illustrations of Jan Marcin Szancer and Per Dahlberg, designer Szotynscy Zaleski created an illusion that the building is melting. The fluid curves of the blue and green enamel tiled roof are reminiscent of dragon scales. 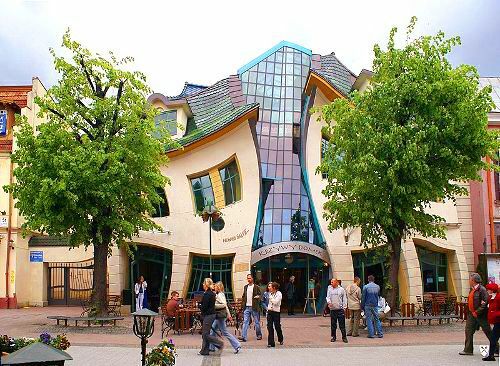 The Crooked House is located in a busy shopping area and is home to restaurants, bars, cafes and retail stores.